Martin Zweig Growth is a growth at a reasonable price investing strategy based on an approach explained by US investor Martin Zweig in his book, Winning on Wall Street. It combines a focus on growth characteristics, value attraction and market timing. It uses various measures of earnings and sales growth and uses the price-to-earnings ratio as a valuation tool. Zweig's strategy also looks for relatively strong price action. Zweig wrote: "I've found that investors who rely on crystal balls frequently wind up with crushed glass. I'm satisfied if I can predict a market trend, get in tune with it and stay with that trend for as long as it lasts." 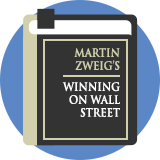 Zweig was a reputed US money manager back during 1990s as well as an investment newsletter writer. During the 15 years that it was monitored (1980 - 1995), his newsletter returned an average of 15.9% per year. Reputed US growth money manager in the 1990’s & investment newsletter writer. Author of “Winning on Wall Street”.